I get so many questions from site visitors that I can’t respond to with a definitive answer, mostly because the question requires some follow up information. Most of the time if the DIYer doesn’t have an electrical meter of some kind to help in the trouble-shooting process, my recommendation is to hire a professional to assist with solving the problem, using the essential tools of the trade. If you are willing and capable of performing minor electrical replacements, additions, or repairs, and if you are allowed by your local rules and regulations, you really need to purchase a good reliable meter. It doesn’t have to be expensive, just a U/L or CSA approved device that is capable of measuring voltage, resistance (continuity), and to a lesser extent, current flow. Most digital multi-meters will perform these basic functions, and at a reasonable price. Here is a perfect example of a situation where a meter is an invaluable tool, and tips on how to use it. You removed a ceiling fixture to replace it with a new one, and in the process you took apart all the wiring splices, and now you can’t remember how to connect them all back together. You tried a few combinations, but most resulted in either tripping the breaker, or part of the circuit not working anymore. The box contains three 2-wire cables. There is only one switch that controlled the light, and the receptacles in that room are on the same circuit and used to work before you started the project. In most situations such as this, the walls are all finished so there is no way to physically trace the wires to see where they go, so without using a meter, trial and error is the only way to attempt to fix this. Not a good method when working with electricity. So armed with this information, I know that this circuit had to have been wired as a switch leg drop. One of the cables is the power in, one is the power out to the rest of the circuit, and one cable goes to the switch. Here’s how we would begin to figure out what goes where. 1. First we will use our meter to ensure that the power is off! By now you are probable quite certain which breaker feeds this circuit as you have likely tripped it a few times while trying to hook this all back up. However, mistakes happen, and memories fail. Set your meter dial to voltage (AC), and with the suspect breaker off, check all the black wires for power, checking first from black to white on each cable, and then check each black wire to ground. If no voltage is present, we are ready to figure this out. 2. If they weren’t already, strip the wires ½ to ¾ of an inch so you can easily get your meter leads on to bare copper for proper testing. 3. Now put your meter dial to the position for measuring resistance or continuity. This will be marked by the ohm symbol, and maybe with some choices for the scale. Most digital meters are auto-ranging so need to select the range. 4. Test that your meter is working properly by touching the leads together. You should bet a low resistance reading. (Low resistance = good conductor and good continuity). Now connect your meter leads to the black and white wire of one of the three sets of cables (having a set of alligator clips with your meter leads is most helpful in keeping good contact with the wires). 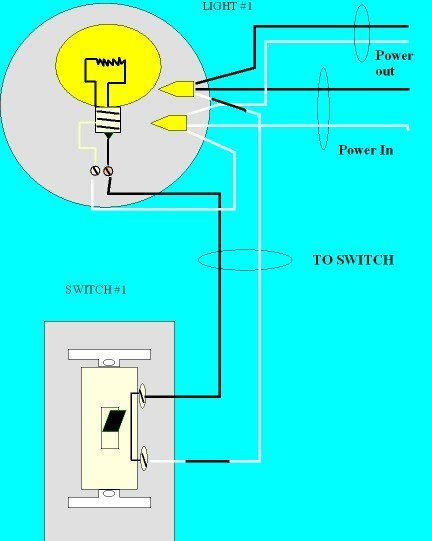 With the breaker off and the wall switch off, you should have infinite resistance (no continuity) on the cable going to the switch and on the cable coming from the source or to the rest of the circuit, there may be a fairly high resistance depending on what else is on this particular circuit. If you have an open circuit across the pair of wires you are testing, go turn the wall switch on. If the meter goes to a low resistance reading, that is the cable to the switch. (Many meters will have a tone function that will make an audible sound when continuity exists and this can be handy if the switch is in a place where you can’t see the meter). 5. Now mark the cable that goes to the switch by identifying the white wire with a piece of black tape, or a black felt pen. (If it was already marked as it should have been, then step 3 wasn’t necessary, but was a good exercise in using a meter anyway)! 6. Now with the wires all in free air, and not touching each other or the ground wires, go turn on the breaker. 7. With your meter dial set for voltage (AC), check from black to white on each of the other 2 cables. 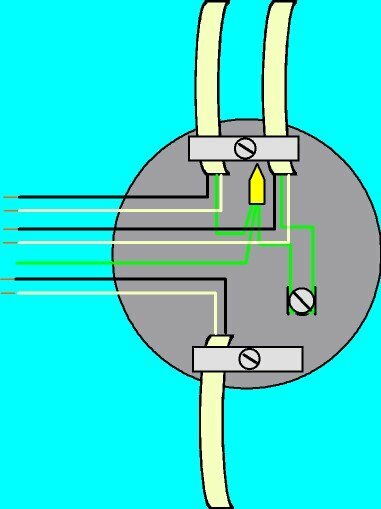 The cable with the voltage present is the power in, and by process of elimination, the remaining cable feeds power to the rest of the circuit. Identify this cable or make note of which one it is. Shut off the breaker again before proceeding. 8. Now we are ready to put this back together. Assuming the ground wires are already properly connected, starting with the neutral wires, connect the white wire from the power in cable to the white wire on the power out cable. You will also connect the neutral for the new light fixture to this splice, either by splicing in the supplied white wire from the fixture, or by the use of a pig-tail for connection to the light, whatever the case may be. 9. 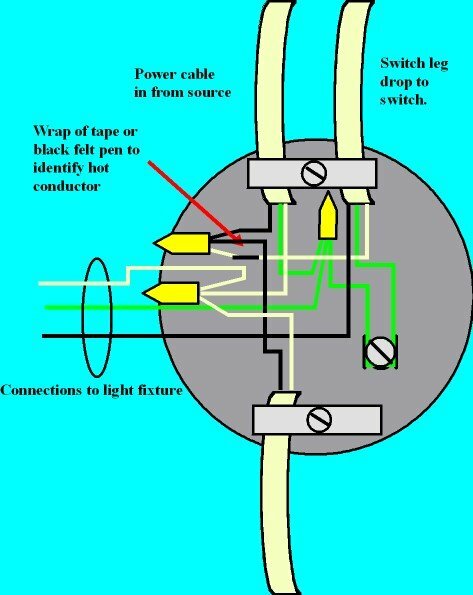 The black wire from the power in cable will connect to the black from the power out cable, and to the white identified wire of the cable that goes to the switch. 10. The remaining black wire from the cable that goes to the switch is what gets connected to new light fixture. 11. Mount your new fixture to the box using the hardware provided and test your circuit. Everything should now work as it did before you messed it up! Still need a little more instruction on how to use a meter? 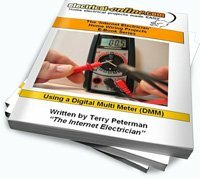 Check out my e-book: “Using a Digital Multi Meter” for a more detailed look into the workings of these “must have” additions to your DIY toolbox. Purchase the instantly downloadable e-book today by clicking this link. For an even greater value, purchase “The Basics of Household Wiring” DVD along with the e-book and be fully armed for any of your home wiring projects. Click here for more information. Convinced that you need a meter? Here are a couple of recommendations for great meters that will meet the needs of most DIY’ers (and professionals) alike that are available for purchase through Amazon! So with this example of what a meter can do for you, it’s easy to see why it should be an essential part your electrical tool kit. Don’t delay, get one today and we can help you complete your electrical projects and repairs efficiently, and safely! This entry was posted in Electrical Wiring, Meters & Testers, Troubleshooting and tagged circuit tester, digital meter, digital multi meter, meter, multi meter, tester. Bookmark the permalink.